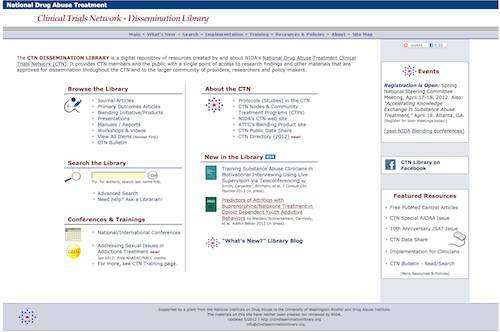 The CTN Dissemination Library is a digital repository of resources about NIDA's National Drug Abuse Treatment Clinical Trials Network (CTN). It provides CTN members and the public with a single point of access to research findings and other materials that are approved for dissemination throughout the CTN and to the larger community of providers, researchers and policy-makers. The CTN Dissemination library is supported by a grant to the Alcohol and Drug Abuse Institute Library at the University of Washington in Seattle (part of the Pacific Northwest Node of the CTN), with oversight by the Research Utilization Subcommittee (RUC) and staff of the National Institute on Drug Abuse.